Kids Ear Training is recommended for children 9-11 years old and is best suited for children who have received prior musical education. 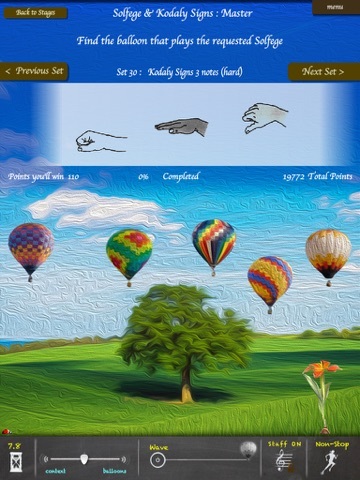 The object of the app is for the user to identify the correct sounds based on a picture or description provided. The overall quality is in line with the price point of the app. The artwork is nice and sets a soothing tone for learning. Images of the instruments could be improved a bit making them easier for children to identify what the instrument really looks like. 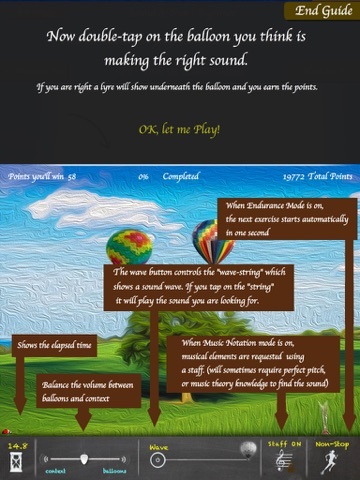 Considering the importance sound plays in an app such as this, the sound quality is good. 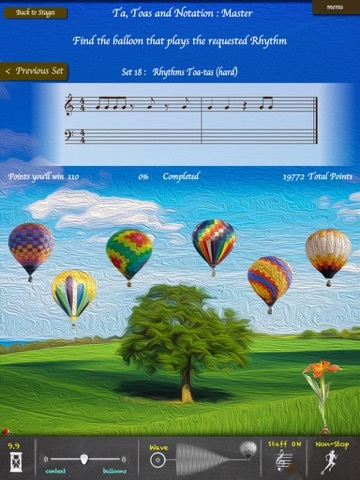 The ability to reduce the background music or sounds is important and is available. The in-app user guide offers enough instructions to get started. All instructions and information are written so users will need to be able to read or will need adult supervision throughout. The Statistics section allows parents or teachers to see how the child is progressing. It provides a good amount of detail. Two learning modes are available and the user can switch between them easily. Guided Study mode requires the user to complete one stage before unlocking the next. Free Study allows the user to choose any of the stages. Each stage (or topic) has many levels which increase in difficulty as the user progresses. A Listen & Learn level is available at the beginning of each stage; however, if your child does not have prior experience with this topic, this may not help. When in the Endurance Mode, the next exercise starts immediately upon completion of the previous; otherwise, the user needs to press a button telling the app to advance to the next question. 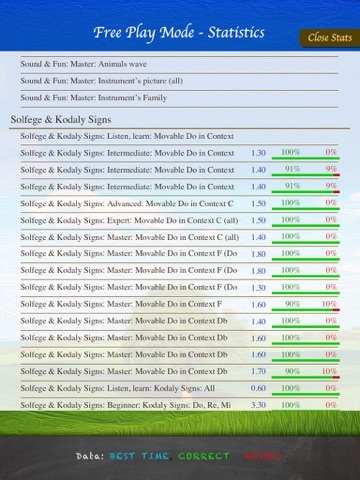 Kids Ear Training is best suited for children who have received previous musical instruction. They will need to know what instruments belong in which family, such as a clarinet is a woodwind and a trumpet is in the brass family. This is not an app for beginners. Including a more detailed learning mode, such as a topic tutorial, would be beneficial in making this a well-rounded music education app. Overall, the learning environment is a positive one, with children cheering you on as you answer correctly. Some children may become frustrated in areas where they are not as experienced, as you continually lose progress with each incorrect answer and there is no method for them to learn the correct answer. This app is more like a quiz than a tutorial. Introducing the topic, in a tutorial type format, then launching into the exercises could be more beneficial, or at least offering it as an option. Unless your child is serious about music education, this app will not be one that children return to as they would a game. The fourth grader I tested this with loves everything to do with music and did return to the app without prompting; however, they did not stick with it long due to the app lacking a method for learning the needed information to be able to progress through the app. Offering a variety of backgrounds may help in keeping the user’s interest. 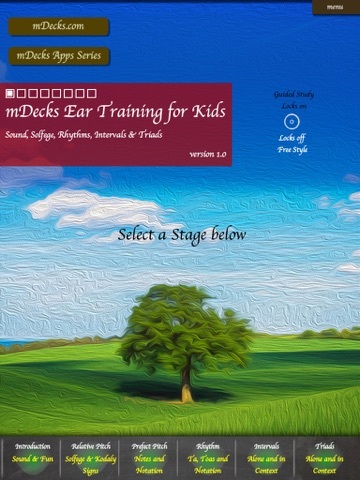 Kids Ear Training is an iPad only app. It does not contain multiple user accounts, which limits families with more than one child wanting to use the app. Overall quality and amount of content is good for an app in this price range. Including additional instructional material would improve the ability to use this app for all children in the targeted audience and avoid families having to look elsewhere for that instruction. This app is completely child friendly in that it does not contain social media or external links, ads or in-app purchases.